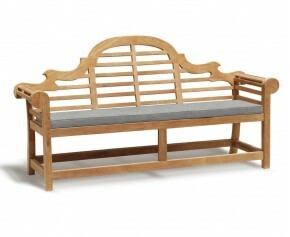 Make your garden furniture a more enticing prospect with these comfortable large bench cushions. Offering the ultimate in quality and comfort, these water resistant 2m bench cushions have been designed to stand the test of time and can be left outdoors throughout most of the warm weather, ensuring trouble free pleasure for years to come. Freshen up your outdoor furniture and sit in the ultimate comfort, with this curved bench cushion. Expertly woven in polyester for long life and aesthetic appeal, this high quality Connaught curved bench cushion will be the envy of all your friends. Add a splash of colour and comfort to your outdoor furniture with the addition of 2.7m garden bench cushion. 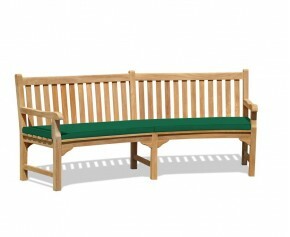 Expertly woven in polyester for added durability and aesthetic appeal, this large garden bench will be the envy of all your friends.